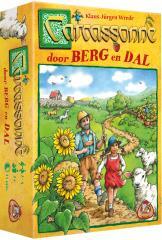 Take a walk through a beautiful landscape full of fruit trees, wheat fields and sunflowers! Nobody can resist a juicy apple or a sweet strawberry here. This new Carcassonne variant has simple rules and is therefore very suitable for new players, but the game also offers strategic choices for real Carcassonne veterans. Whoever has the best harvest, walks around and has the most animals, has the best chance of winning.